In Outlander's third season, fans met a new character by the name of Lord John Grey, played by David Berry. The Englishman started out as a foe of Jamie Fraser (Sam Heughan) — he was the governor of Ardsmuir, a Scottish prison where Jamie was incarcerated for years. But after working together to help the other hurt and sick prisoners, a friendship grew. Season 4 premieres on November 4. The relationship got complicated when it was revealed Lord Grey had fallen in love with Jamie. In the Starz series, the two encountered each other again at the Helwater estate, where Jamie is paroled. When the Scottish highlander has an illegitimate child with one of the daughters of the estate owner, who then dies in child birth, Lord Grey steps in to protect the baby boy. He marries her sister and becomes the child's stepfather. Then, for a third time, the two friends run into each other in Jamaica when Jamie is searching for his kidnapped nephew, Young Ian (John Bell). Lord Grey is the governor of the island and still holds a candle for the Scot, so helps he Jamie find Young Ian and get off the island. Readers know that Lord Grey has his own spinoff book series called the Lord John novels, and fans have been quick to express that they would love a spinoff television series. Recently, a fan asked Gabaldon on Twitter, "Any chance of a John Grey spin off?" She responded, "Who knows? Interest Has Been Expressed, is about all I could tell you." 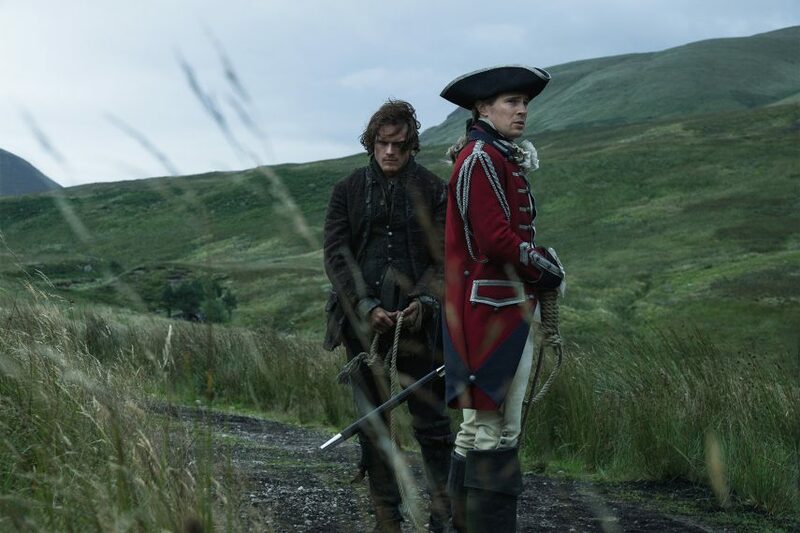 Outlander producer Matt Roberts told The Hollywood Reporter in 2016, "Oddly enough, we always joke about spinoffs, whether it's Lord John or Black Jack [Tobias Menzies] or this person or that person, because there is just so much material." "Diana [Gabaldon] gives us so much in the books that you can probably make 10 series and the fans would watch it all. We haven't really discussed it seriously if we could do that, but that would be something for Starz to order before we could start talking about it seriously. But we know there's a whole line of books that Diana wrote about just that one character, so it was great to have his introduction in my script," he added. Starz hasn't made an announcement but fans of the time-traveling drama have a lot to look forward to as Outlander's fourth season is set to premiere in just a few weeks.